My interest in creating physical representations of the animate and inanimate ‘images & things’ in the world around me began early in my life. Since becoming a Sculptor, I am always looking for and observing sculpturally inspiring subjects, especially during my numerous world travels. 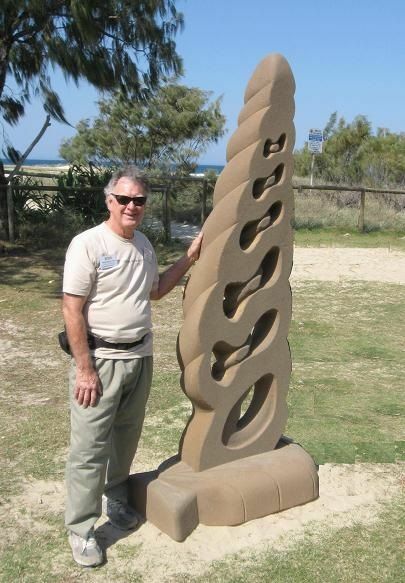 Since my first Sculptors Queensland Exhibition in 2003, I became determined to harness my visual imagination and hands-on skills into creating diverse sculptures, using a variety of mediums including: stone, wood, cement, glass, polystyrene and found objects. Numerous sculptural skills workshops, symposiums and courses have broadened and developed my capabilities. Among my favourite sculptural subjects are the human female form, animals and all objects of nature. My exaggeratedly enlarged, cut-a-way seashell sculpture series are common objects seen from a perspective that challenges the viewer’s perceptions. My Polar Bear series of sculptures are my attempt to create a series of small, simplistic, stylized sculptures which were inspired by the simplest forms created in Hot Glass.